Fragrance Personality: From the countryside villages of India, the Vetiver hedges, stand proundly, offering their ripening aromas to the first winds blowing by. 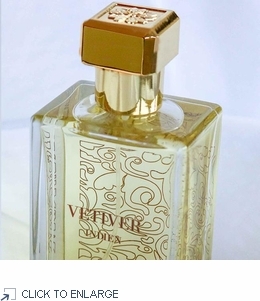 Indian Vetiver, a deliciously fresh, sparkling, woody and fruity fragrance. Base Notes: Woody, Amber, Vetiver from Haiti, Myrrh from Ethiopia, White Musk, Amber, Tree Moss from France. Made in France. Beautifully boxed; 100ml natural spray.